Kobe, Kobe, Kobe, Kobe. Yes. We all know how you are. We know you very well. In fact, we know you a little too well. We know that you like score — in more ways than one. We know that you want to be DA MAN. We know that you’re someone that basks in the limelight of having everyone be in awe of your talents. We know that you probably like the movie Scarface (call it a hunch)… what we didn’t know was that you wanted to be go back to 1980s Miami to be an extra for the film with that getup of yours. Your daughter Natalia probably thinks you’re going to a mango factory now. Shame on you. 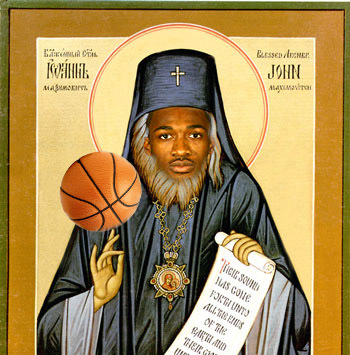 Sure, I haven’t really mentioned the patron saint of us online hoop heads—Archbishop Agent Zero, here at the HQ for a second, reason: I friggin mentioned the hell outta him over at BulletsForever just a couple days ago! In your first game against Toronto, those guys were making a serious run at you. And you guys were in the huddle during the timeout laughing and smiling. What’s that all about? TB: You just have to be somewhat loose in pressure situations. If you’re not loose in pressure situations and you are tight, you can’t perform. So I try to keep loose in those situations and not get bogged down in nine-thousand different little details, but make it pretty simple as what we have to do. Toronto took the lead and they were looking over at me because they thought we were going to take a time out and we didn’t. We pushed the ball and (Mike Miller) hit a three. That was as good as anything I could have said during the timeout. That’s the way I look at it. It’s interesting because they seem to have just DEMOLISHED the 5th place LA Lakers with seven players in double figures! With just E. Jones scoreless on the active roster. A big Doube-U Tee Eff? I think it’s that loose-ness they’re playing with, since they’re the worst team in the lig and really just having fun out there and really don’t give frak. They’re the type team right now that other teams hate to play against. LakerBlog breaks the game down while Beale Street Beat says Barone’s good coaching aint no fluke. Something something about Jason Kidd‘s personal life—eh… I’ll just say this: hopefully TJ’s head will dissolve back to normal size as it doesn’t need to deal with his crazy ‘rents being together anymore. Oh and Joumana, call me! We’ll play chess or something, I’m wild too! Gilbert Wants You To Vote, For Him UPDATEDx2! Hot damn! Agent Zero brought down the thunder against Cleveland on Saturday didn’t he? BulletsFever breaks it down here (I agree, the gold unis live in action is fugly!). UPDATE!! Yes, you can REALLY buy them now! And I don’t even have to break into those high facility plants! Check out the back: Enjoy 🙂 !! The picture says it all dun’t it? Well, I needed to say THAT… but you know what I mean.. okay I’ll shutup now.. join the discussionz..
And seeing as we’re approaching the holiday-of-reluctantly-buying-crap for people you may or may not really like, I’d like to send out a wish for a gift I’d like to receive (that’s how it works right? Begging?) A while ago over at FreeDarko, they featured UndrCrwn’s Dynasty tees. When I tried to make the checkout payment, I was met with e-Commerce ethnic discrimination! See for yourself what they gave me! While the label died a quick death as soon as people figured out that bikes weren’t cool, their influence still permeates to this day: DMX is still dropping records, the Lox still haven’t recovered and Swizz Beats still has a career. For shame. #2 and #1 are G-Unit (haha, were they EVER really a unit??) and Murder Inc (dis)respectfully. Though really, they’re all losers in the name of hip hop. Now surely someone as athletic as VC should by all means have some sort of signature celebration whenever he wreaks havoc above the rim. However, this is so not cutting it. I mean, I get the significance of the symbolic nature to which one may or may not “rev it up”, but it looks sooooo silly. Not to mention the dangerous social impact Carter is causing: worldwide increase in demand for air motocycle handles. But the point is, (and I think there is a point..) it’s not authentically “cool”. It feels and looks generic. You almost think that Carter is going for the highlights solely for the sake of the celebratory vroom vroom. When they first did this back with the Clips I remember fondly, “what the eff?”. Then, the next day during a HS practice, all my teammates were doing it. What? Did I miss the fun train? I clearly didn’t get it nor did I really want to. At least VC could back up his thing with the notion that his team is winning (debatable!!). But when Miles and Q did it, they were still the “bad L.A. team” so I couldn’t help but think: dudes, you haven’t won jack to show for it. I mean, I couldn’t even find a Darius Miles pic for this, even the internet thinks it’s dumb. And I really think, to this day, the true reason for his separation from Brandy is caused by those excess trauma to the head.. how else can you split from f-ing Brandy?? Actually, you know what? LJ’s signature is pretty awesome. Especially when he nailed that 3 pointer AND the foul against the Pacers at the Garden during Game 3 of the ECF. No gripes here. Stromile Swift’s “Puppet Theatre” in the shape of a bird. I couldn’t find evidence of this either, but I think y’all know what it is. My problem with it is how complicated it is for one to go about doing this taunt. First you have to dunk, then land, then cross your hands, inverted, at the thumbs. DUDE, that’s too much! Tim Thomas’ “Can’t See Me Now Thingy”: This one I can take it or leave it. He hit huge shots at crucial moments and well, he CAN ball. Let’s hope he can keep it up. Sam I Am’s “Alien Balls”: I give it to him, it’s funny. Mini-UPDATE: Seth and Balding Spalding (sorry to be harsh on the vroom vroom machine, I’ve been envyous of it ever since Top Gun…) bring up a couple I missed, like the FatOne’s Shimmy, and Dirk’s Tongue of Happiness. No doubt there are more missing, feel free to contribute in the comments below! Anyway, if the celebration is fluid and not dorky I’m all for it. Just don’t pretend like it’s so “street” and fake-cool. Housekeeping: I did my weekly appearance radioshow to chat hoops today (though t’was a shorter segment as this thing called “football” is soooo important). As soon as I get the file (whenever that is…heh) I shall uploadz that ish. Word. Paging Mr. Stern: one piece triathlon suits are in! Look into it asap! I’ll end today’s post on a solemn note by just saying that my thoughts and prayers are out to the victims and their families and the whole Dawson College community here in Montreal. If you don’t know what I’m talking about.. I won’t get into it (still hard to wrap my head around it, being a little too close for comfort). It was a bad day, but as a Montrealer, I know we will be able to get better soon, we’re tough like that.